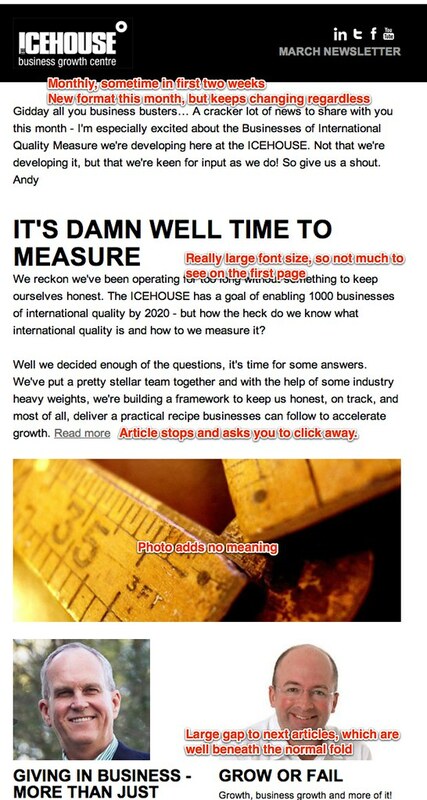 What makes for a good newsletter? 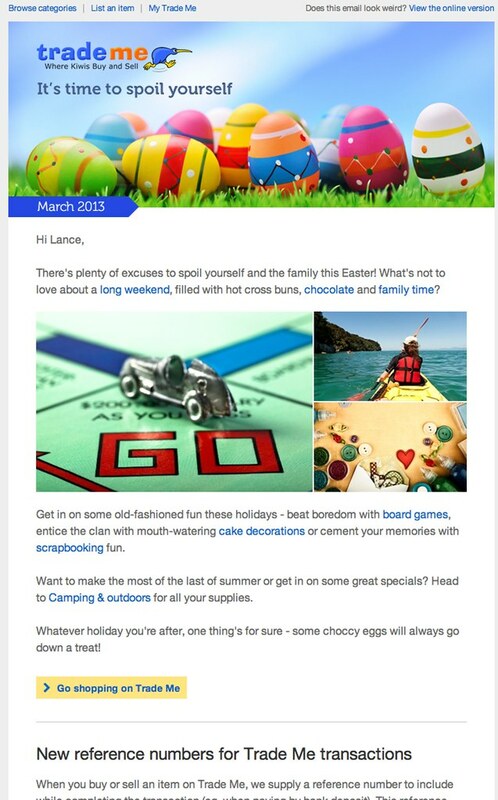 Posted byLance Wiggs	 March 8, 2013 March 8, 2013 1 Comment on What makes for a good newsletter? About 13 years ago I started an internal newsletter at McKinsey, with the intent to educate and inform other consultants about the goings on online and in telecommunications. That first newsletter was a PDF of several 800 word articles that were painful to write and get written, but even more painful to read. The PDF had to be opened from email and then read on a computer screen, and those screens were pretty small and poor quality back then. The articles were too long, and the process of creation was completely unsustainable. So I started again the next week, and from then and every Friday thereafter I sent out a text email titled “The e-Elevator Factoids of the Week”, to a distribution list that over time steadily and at times alarmingly increased. The factoids were 2-3 line snapshots of what was going on in the two industries, and were deliberately snarky and amused about things like over-priced sales of 3G spectrum and the launch and failure of a succession of dot coms. 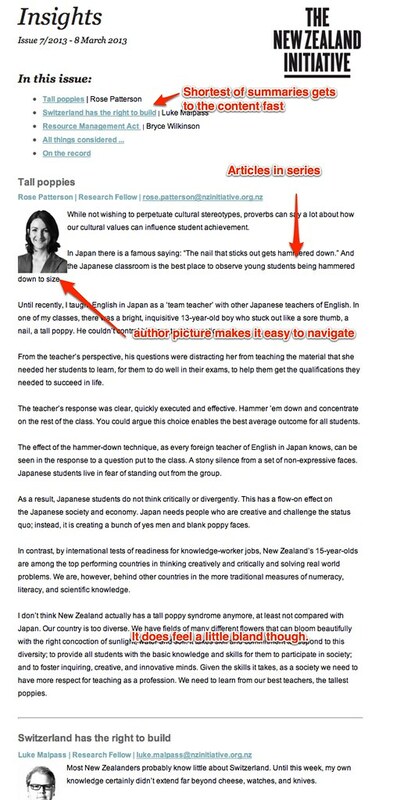 It may not have been the best format for deep analysis, but the intent was education, and using humour was a way to get readers engaged and looking forward to the results. It was hard and time consuming work – each topic had to be selected from the mass of other potential topics and then the lines crafted in a way to be readable, humorous yet informative. For end users the Factoids were a quick, fun and informative read, and, from what I understand, they did get read a lot. Fast forward to today, and the age of HTML formatted email and regular newsletters. Today two newsletters arrived in my inbox within minutes, and then another while I was writing this post. 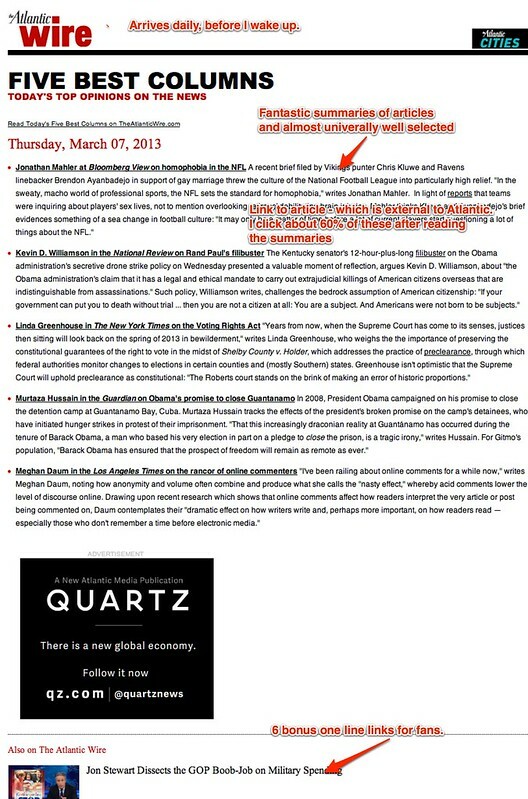 Above is what I could see when I opened the email (so called “above the fold”). This was on a larger external screen, so smaller screens will see a lot less. Overall there was sufficient content for me to start reading. Sometimes it feels a bit overwhelming, and perhaps several shorter earlier pieces could work, but overall I can read the email and be done, regardless of the device I am on. Here’s the next few screens of the email (I’ve reduced the typeface to fit more). The articles are a bit shorter and it’s easy to read. I clicked through and actually read four documents referred to in the email, and certainly learned a lot. Well done Webb Henderson. The next newsletter to arrive was from the Icehouse. It’s monthly, but arrives at different times each month. The format changes, seemingly every time, but that’s all good in the spirit of continuous improvement. What I don’t like is the way the content is hidden, firstly behind a very informal introduction, and secondly behind some large photos. Meanwhile the font seems rather large, though perhaps that’s a function of older angel investors versus younger lawyers and infrastructure investors used to tiny turgid prose. But the real bugbear for me is that this newsletter contains no real content. All of the content is hidden behind a click, and there are seven main ones, and eleven in all. It may be nice when we send email newsletter to track the number of times each article is read, and perhaps that why this is occurring. But I argue that the friction of enforcing clickaway will sharply reduce the number of people who actually read anything at all. I would also argue that lengthy articles are not the problem, it’s the click. we don’t mind lengthy emails. So I clicked on no links, and so the Icehouse lost an opportunity to update me on their goings on and share some insights. And that’s sad. I have a 100% read-rate, and a very high click through rate as well for the Wire. 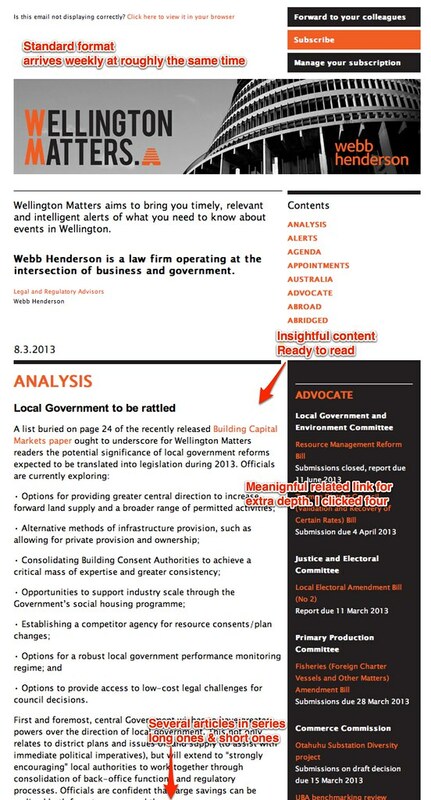 The third newsletter to arrive, while writing this post, was The NZ Initiative’s weekly newsletter. It is sent consistently every Friday, and is a simply designed, long form series of articles. I read about 20% of them. I guess I don’t read more as I’m not such a fan of the content, or am not familiar with the authors’ work. Or perhaps it’s that it feels a little bland. But I do keep subscribing and generally scan it for anything interesting. Perhaps it suffers from arriving after the much better designed Webb Henderson newsletter. Focus mostly on curating and creating excellent content – and that create readers who wait desperately for your material. Send the newsletter at a consistent time, using a consistent format and with consistent quality. Show the entire article, or at least as much of it as you legally can. I we can’t see it, it’s not likely to be read. Provide a link to the online version so that it can be easily shared. Hi Lance, glad to hear you’re enjoying Wellington Matters! We’ve received a lot of great feedback. Readers interested in receiving Wellington Matters can contact us at wellingtonmatters@webbhenderson.com, and we’ll make sure they get a copy each week.